With the newly updated 3 Star Demotion skill, you can use it to normal summon a Gate Guardian monster without the LP cost once per duel. Pair this with Black Luster Soldier and its supports and you will be able to summon high level monsters pretty easily. Can be used when you have 1,000 or less Life Points. Until the End Phase, reduce the Level of all monsters in your hand by 3. However, it can be used on members of the Gate Guardian trio at any time regardless of Life Points. This skill can only be used once per duel. Since the skill can be used without the LP cost to summon any of the Gate Guardian monsters (Sanga, Kazejin, and Suijin), you can summon 1 of these for free! The skill can only be used once per duel, so you'll have to consider carefully when to summon this. It's important to remember that its effect can only be used when it's attacked, and can only be used once, instead of per turn. After you already use the skill to summon a Sanga, the other Sangas can be used as fodder for tribute material for either Black Luster Soldier, or Relinquished. Gateway to Chaos: Early on, it's better to go for BLS so that you can use the Spell Counters for its ritual spell. When you are low on cards later on, you can use it to take Swift Gaia from your deck to normal summon a high attack monster. Black Luster Soldier: It's a high attack monster with no effect, but through Gateway to Chaos and Super Soldier Synthesis, you can summon BLS quite frequently since it can be searched and special summoned from the graveyard. Swift Gaia the Fierce Knight: Its main use in the deck is to be searched by Gateway to Chaos, and still be a good monster to summon when you are low on cards. Djinn Disserere of Rituals: This support monster is used as part of the sacrifice to ritual summon either Relinquished, or BLS, making them unaffected by your opponent's trap effects. Super Soldier Synthesis: This ritual spell card has a tricky requirement to summon BLS, but it can effectively bring it back from the grave. Use Djinn as part of the sacrifice to make BLS immune to trap effects. Relinquished: Best used if your opponent summons a strong monster so that you can take it, but it can be risky to use if you think your opponent has Enemy Controller. If you have higher LP than your opponent, summoning Relinquished can be a big advantage since you can always attack into your opponent's monster to deal damage to them, it's a good last ditch effort. You can also use Sphere Kuriboh from your graveyard to ritual summon for Relinquished. Anti-Magic Arrows Because of the high attack monsters in the deck (and relinquished), you can go for an easy win by ignoring the backrow, catching them by surprise. Fulfillment of the Contract To bring back ritual monsters in the grave that was ritual summoned before. Sonic Bird To fetch some of the ritual spell cards from your deck. A/D Changer Useful for ritual summoning BLS or Relinquished, but also has a good second effect that can activate in the graveyard. How do you get more than 1 sphere kuribo??? Im a newbie I have no idea!! Theres only 1 in shop?? Tick " box reset "
best way to farm for 3SD? 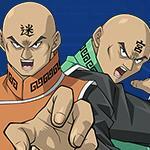 Been farming gate duelists with paradox bros...but after they added skills to pvp and standard, is that better? I like how this was taken from Duel Links Metal and they didn't give Dkayed any credit. All they did was change sphere kuriboh for sonic bird. Nah, It's okay. I stole this deck from GameA anyways. Hi , actually King Halo was the first i saw posting the deck recipe in his youtube channel , way before . ( https://www.youtube.com/watch?v=s9I87jsjYJc ) . Kind of jank but fun to play. "Black Luster 3SD" but only see 1 ritual BLS with 2 Relinquished. You can Summon Black Luster Soldier From The grave or hand using its ritual Spell, but u can’t do the same with Relinquished. I will try it thanks!